"That's awful. I love it." — J.R. Antrim, IC founder. Santa's Coal Bubble Gum, Jack-O, An Interview With Mr. Pumpkin. last night i bought a box of limited edition strawberry whoppers!! i thought - great yummie strawberry whoppers!! 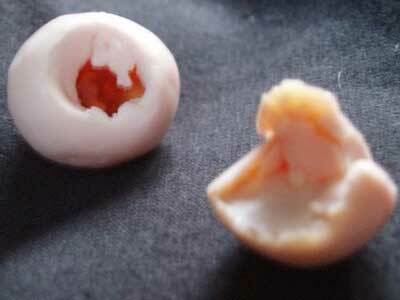 well this morning with the box half empty i peered inside to find at the bottom of my box - 2 SPIDER EATEN WHOPPERS!! one was smooshed and the other had a whole in it!! EW! we must band together to defeat these monsters and defend the good name of Hershey's chocolatey goodness!! i hope these pictures are proof that Hershey is being overrun by whopper eating spiders - and maybe we have found a new species in which case we shall collect all the profits!! Dark times are upon us when not even limited editions are safe from the spider menace. Granted, the smooshed whopper could have been the work of some careless factory worker, but no man on earth was responsible for the strawberry soul-sucking evil evident in the leftmost whopper. How far will we let this go? If our whoppers aren't safe, what then? Our children? Our skunks? Will our favorite easy chairs and personal computers become the hollowed out home to an acid-spewing spider? A shocking 37.2% of people subconsciously emit whopper brainwaves during the Hommschrögen-faust stages of the REM cycle. 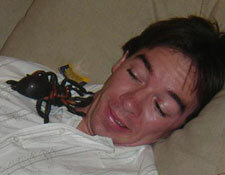 In layman's terms, a whopper spider could mistake your sleeping head for the mother of all whoppers. And once it works its way into your ear, your head will be as hollow as a pumpkin. After toiling in the Ironic Consumer workshop, we have come up with one possible solution. It will not protect your whoppers, but it could save your life. Wrap towel around head, making sure to completely cover your ears. 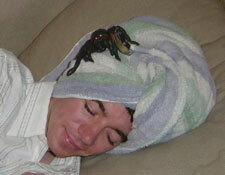 Rest easy, knowing that no acid-spewing spiders will ever gain entry into your head. Unless of course they're already in there. I mean, then they'd just sort of be trapped. — J.R., with a little help from Agent Ted. Created by J.R. Antrim. Copyright © 2003-2005. All rights reserved.